In March 1991, I wrote a letter to Smt. 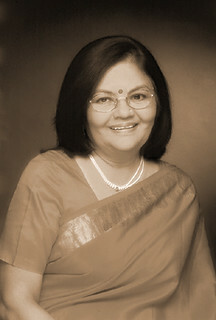 Tarla Dalal. By then, I was convinced that if angels have to be granted existence, she was one of them. I was then an housewife, a young 26-year-old woman struggling to find a self-identity within the four walls of the kitchen, since I spent the maximum time there, trying to get things organized for breakfasts, lunches and dinners for an extended joint family. Always wanting everything precious to be recorded, including my thoughts, I penned down my gratitude to Tarlaji and actually posted the letter to her. Those were days when even photocopying was not such a common practice, hence I sent her a neat fair copy of my letter, keeping the rough one for my records. Years later, I keyed it into a file on my laptop. Here it is. I am one of your most ardent fans and for quite a long time have had the pleasure of being known as a very good cook. However, the credit for this mist go to you because honestly speaking, I don’t do anything, other than follow the instructions from any one of those innumerable Tarla-Dalal-Heaven-Sent recipes. Your books are an eternal source of inspiration and contentment – I know this statement may seem unreal, but it is true. To cook well, serve well and be praised for the food one makes is the source of utmost happiness to any cook. I am 25 years old and belong to a Marwari family. I was given away in marriage at the age of 20 when I was freshly out of college and had been so absorbed in my studies that I did not have any time to explore my culinary potentials. Luckily, extremely so, I received two of your books as a wedding gift and was saved by the miracle of your books. Your books became my bibles, so to speak, and inspired me to bring about a change in the usual style of serving. I started trying out your unusual recipes, served differently and presented quite unconventionally. For the last 5 years, I have hosted innumerable parties for groups of 20-30 people at a time and have been very satisfied with the results. I am still dizzy from the excitement of a last night’s “Tarla Dalal supper” and the flow of compliments I have received! Thank you, once again, madam for being a guardian angel in my life, and I’m sure in the lives of many others too. You are a blessing from above. I always wrote letters to those who inspired me. Some of them include Linda Goodman, Hindi Novelist Shivani, actors Dharmendra and Meena Kumari, Cookbook author Smt. Chandra Padmanabhan and my best friend who broke up with me in school. But I never received a response. Therefore, when I received Tarlaji’s response, my joy knew no limits. For days I showed her letter to everyone who came home. I even framed it in a photo frame and kept it by my bedside. Just 4 simple lines saying she was happy to receive my letter, and that if I am ever in Mumbai, then she would be delighted to meet me. May be she responded to all her fan mail which speaks highly of her indeed! But this one was special…it was for ME. Warm greetings. Enclosed please find my letter to you dated way back in 1991. It has been retyped and therefore may appear slightly different from my original letter, but the content is exactly the same. I received your warm response within a few weeks which also I am enclosing herewith. My admiration for you and love for your recipes has only enhanced over the years. The proof is the fact that I have preserved my one-time correspondence with you over such a long span of time. Your books were a tangible milestone in my journey of love for the culinary art, for cooking, for feeding near and dear ones…and today I am happy to present to you yet another milestone in this journey – Cooking at home with Pedatha, a cookbook co-authored by Jigyasa Giri and myself. She again responded immediately and sent us a lovely comment that we were honoured to print on the dust jacket of our book when it went into its second edition. Later, she came to Chennai to attend a felicitation event organized by Karuna International when the book won the Gourmand Award. She shared two lovely days with Jigyasa and me. Her warmth continues to flow. Thank you Tarlaji for the wonderful food writer and person that you are. 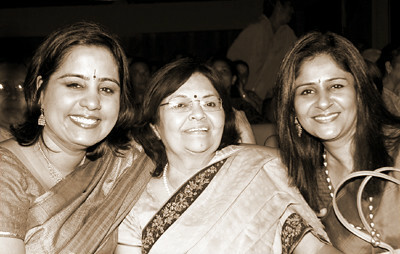 Tarla Dalal is a renowned cookbook author and celebrity who has written more than 100 books and many more articles. Click here to read her tribute to her mother who was her inspiration. She passed away in November 2013. Please share with us your thoughts and inspirations in the comment form below.